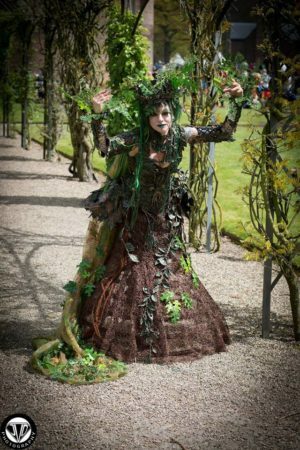 This magical Dryad costume was made by Liddy Ackerman, an Organic Armor Arts student based in Amsterdam. She signed up for the course in January and has already made the elaborate corset and accessories seen here. She kindly answered some questions about herself and her process, revealing what a multi-talented and patient artist she is. Since childhood I have a strong fascination for fairytales and historical costumes. This lighted a spark to create costumes myself, with trial and error being an autodidact. I’ve done historical costumes of about every period from medieval gowns to Tudor, 18th century court gowns and victorian/steampunk styles. Next to that, I just love to make fantasy costumes! Last year I did a stained glass (living cathedral) costume with transparant worbla and glass paint. 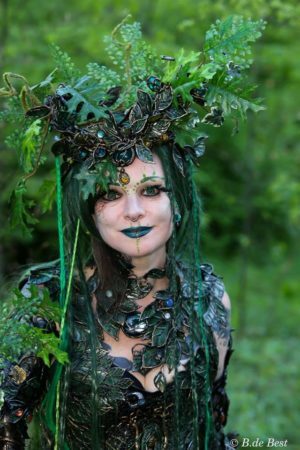 What made you choose a dryad for your first Organic Armor Arts costume? A Dryad has been appearing in my head for some years now but I could never find the right materials to create flowing, organic shapes. The Organic Armor techniques are just made for that! Now that she is finished, she is very comfortable to wear and remains so flexible. Describe the costume for us, what materials and techniques did you use, what were the various parts? First, I created the “tree trunk” shape by making a skeleton crinoline with hoops flaring out at the bottom. Then, with a copper coloured crocheted fabric I created a skirt to go over it. Then I created the harness with two layers of canvas, lined with buckram and boned with 4 metal bones, and a breastplate of worbla sandwiched in between. Then that was rubberized and I started making the 700 leaves with canvas, by first cutting leaf shapes of canvas, inlaid with rope to create the leaf structure. 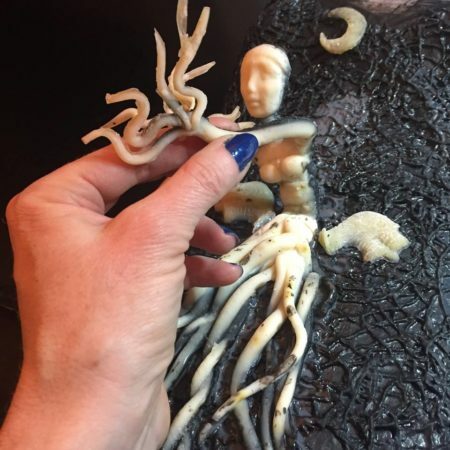 Then I sculpted a dryad, made a mold of it with oogoo, and cast her in liquid latex. The most challenging was how to fit all my wishes into only one harness! She has a moon, two Norse dragons flanking her and a lot of semi precious stones. The hip segments are twisted ropes of different thicknesses, with a few hanging branches with leaves kept dangling. It is completed with four bracers, with protective runes, more Norse dragon heads and settings for the stones. It’s very intricate, how long did it take to make? About a 1000 hours approximately according to my husband, Personally I think 600 – 700 hours but I just didn’t count. What was the best thing and the most challenging thing about making it? The best thing was how easy it turned out to sculpt something with these materials and make that an integral part of the design. That is just awesome! And a very nice surprise as well, didn’t really expect that part would turn out so great and would be so easy to make. The challenging part was the headpiece and how to stabilize it and keep it staying on my head. Where have you/will you be wearing it? 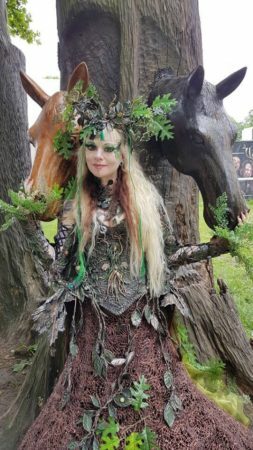 I have been wearing it to the Elfia in Haarzuilens (NL), one of the biggest fantasy events in Holland. And to a Medieval MPS, Mittelalterlich Spectaculum, in Germany, where I won the first prize with it at the costume contest! You set the bar pretty high right off! What do you think your next Organic Armor Arts project will be? Someone in my house is asking me already to create something for him, it will be a Dark Dragon lord warrior costume… if all goes well with that, I’ll make a Dragon Priestess to match it! Not everyone starts off with as complex a first project as Liddy did. She is certainly an inspiration! The online course walks you through the steps of making a pair of armbands, teaching you the Organic Armor Arts methods which can then be applied to all kinds of forms. See a range of student work here.